In this guide you will learn how to manage your user's submissions approval, you can mark submissions as Approved or Disapproved using Hidden Box tool. This is somewhat like an Admin Approval System. This is very useful for booking forms for accepting or declining user's booking entry. It's also useful for application forms, you can approve applications if users meet the requirements or simply disapproved them if they're not. 3. While on the submissions page, just select submissions that you'd like to update on the data grid below and click Edit button above. 4. After clicking on Edit button, you'll be able to see your form with user's data on it. Now, just look for the hidden box field (dotted style box) that we've added to your form earlier and write a status. e.g. "Approved" or "Disapproved". Be sure to re-submit the form to update the edited submission. 5. If you'd like to notify users of the status of their submissions or fire up a notification depending on the status you've entered, you can apply an email condition. If you have questions or if you're having difficulties with any of these steps, please write your comment below! Does this tool only work when using the all questions are listed on the same page format? I am having difficulty locating the hidden box tool when I am using the one question per page format. Any help would be greatly appreciated. 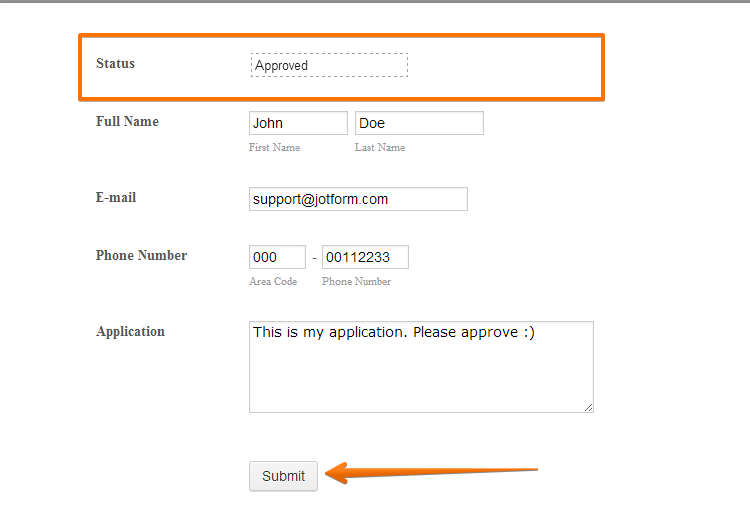 Is it possible to just send an e-mail to the approver for each submitted form with a link to the form and allowing the approver to approval or reject the form? Also, allowing the approver the capability of telling the submitter why their request was rejected. This looks helpful but can I also hide a submit button beside the status field? I have a 5 page form but need to add a status field to the top which could be updated quickly rather than paging through the whole form to reach the submit button at the end. Any advice? Is there a way to do a mass update to a hidden attribute such as status across multiple submissions? This would be useful rather than having to edit each record individually. I do not see the Power Tools option any longer. I had it and used the Hidden option and used it on one of my other forms but now it doesn't seem to be available any longer?? Thank you very much, that's exactly how I've set the form until now. The radio button would be faster as I should only click to set the status as "paid" instead of having to write it manually. How do I get a report to only show those that been approved using a hidden box.? How can I use Hidden Box to display current date?